Every time I go to Olive Garden, I love ordering the Zuppa Toscana soup. It’s the epitome of comfort food. 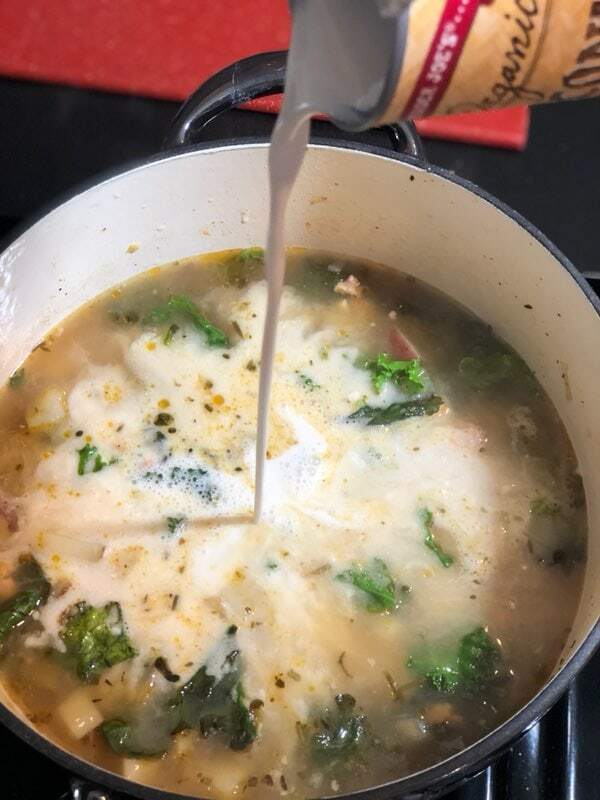 I created a copycat Zuppa Toscana soup that is dairy free and it is amazing! Love a rich creamy potato soup but wish it was lighter? 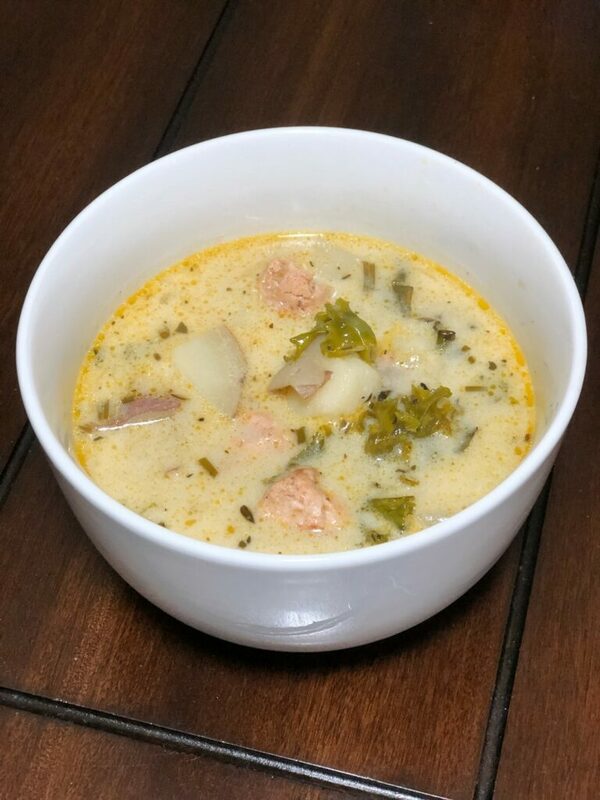 Try this lightened up version of Olive Garden’s Zuppa Toscana that is perfect for a gloomy day and will warm your hungry tummy, and not leave you feeling so full after. 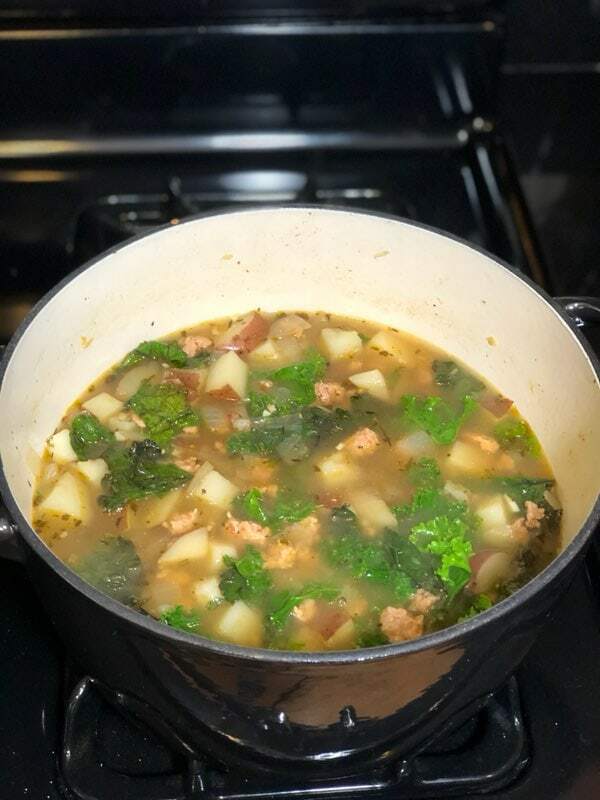 I had some potatoes that I needed to cook before they went bad and absolutely love the Zuppa Toscana from Olive Garden. 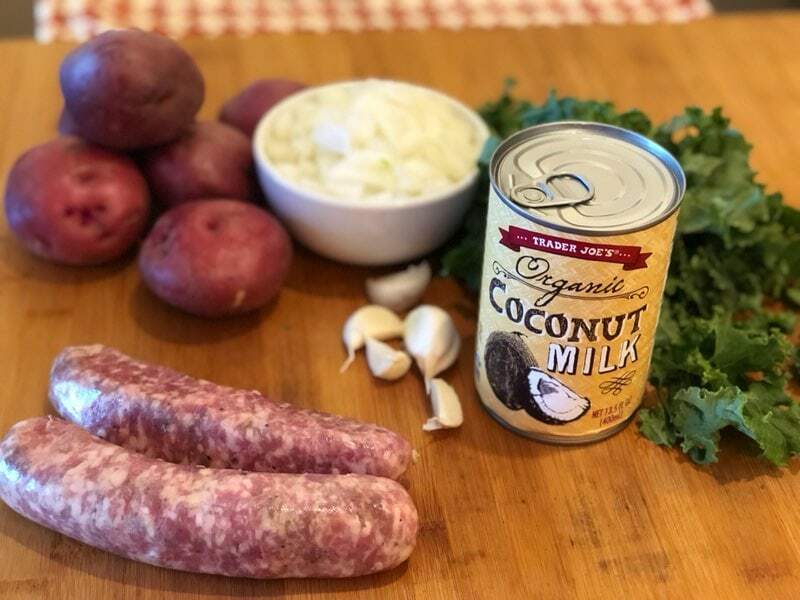 It has all the ingredients for a hearty soup, potatoes, sausage, cream, so I had to put my thinking cap on to reinvent this favorite soup into something lighter and make it dairy free. Luckily I always keep a can or two of Coconut Milk in my pantry to create creamy dishes without the dairy. I hope you enjoy this dairy-free version of a classic creamy potato soup! Olive Garden’s Zuppa Toscana soup is full of delicious ingredients. But, it is also full of dairy. If you are trying to eat dairy-free, coconut milk is a good substitution. Coconut milk is full of healthy fats. It also fills you up without you eating very much. 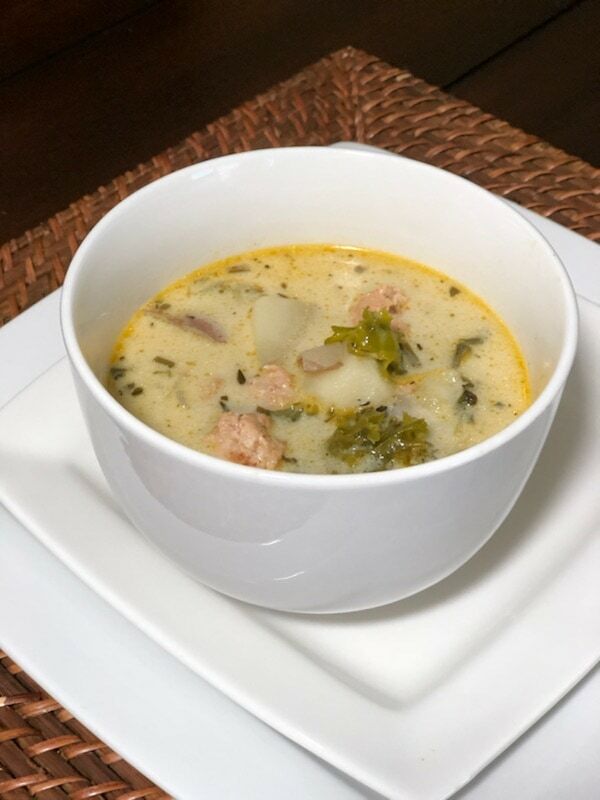 Zuppa Toscana is known for being a potato soup. So even though I wanted to try and make a low-carb version, it isn’t possible with the potatoes. You could use fewer potatoes to cut down on the number of carbs. If you are following Whole 30, try using sweet potatoes instead of red potatoes. Make plenty of this soup – you will want to eat the leftovers the next day. This is a dairy-free version of Zuppa Toscana from Olive Garden. Add olive oil to a large pot over medium heat. 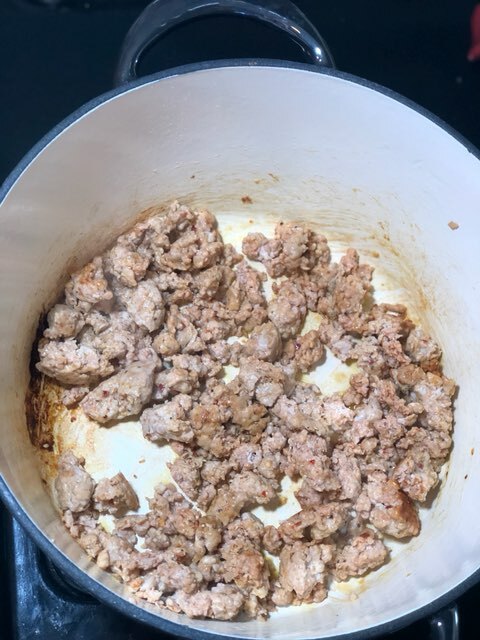 Remove casing from sausage and cook until browned breaking into smaller pieces. Stir in chopped onions and cook for 5 min then add garlic and cook for 2 minutes. Add salt and pepper. Add chopped potatoes (skin on) and Sautee for 5 minutes. Pour chicken broth into pot and bring to a boil. Once the soup is boiling reduce heat to medium and bring to a slow boil for 15 to 20 minutes, make sure potatoes are soft. Lastly stir in kale and coconut milk, be sure to shake coconut milk in the can very well before opening and adding to the soup to combine it (coconut milk separates in can). Print the recipe above and save it in your recipe book. This is an amazingly flavorful soup. If you want some step-by-step photos of the process, I have them below. I love making soup. It is such a relaxing way to cook. Adding ingredients and changing the spices. I can feel my heart going into every motion. Then, the joy as I savor every sip. It’s unmatched. 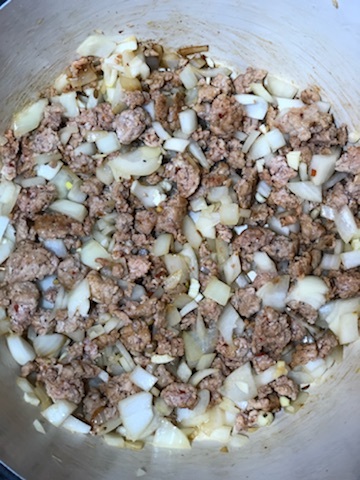 Stir in chopped onions and cook for 5 minutes, then add garlic and cook for 2 minutes. Add salt and pepper. Add chopped potatoes (skin on) and Sautee for 5 minutes. Pour chicken broth into the pot and bring to a boil. Once the soup is boiling reduce heat to medium and bring to a slow boil for 15 to 20 minutes, make sure potatoes are soft. Reduce heat to low and let it simmer for 5 minutes. Lastly, stir in kale and coconut milk, be sure to shake coconut milk in the can very well before opening and adding to the soup to combine it (coconut milk separates in the can). After you make my copycat Zuppa Toscana soup, you’ll want to make these too!